Foals and mares separated during the January 2017 roundup at the Sulphur Springs Herd Management Area in Utah. RTF file photo by Steve Paige. 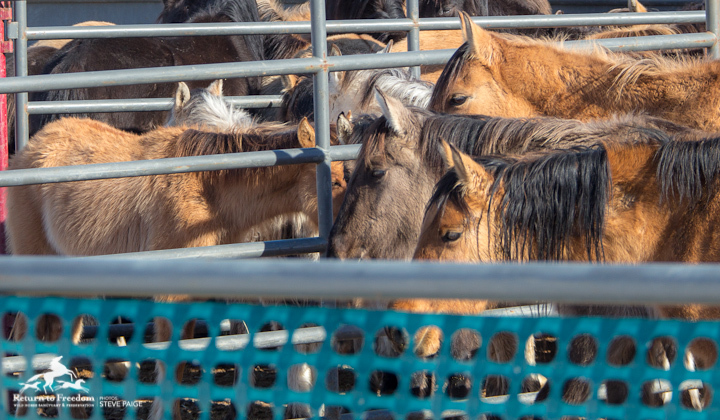 Preliminary results indicate that 25 foals held in a single pen at the Bureau of Land Management’s Litchfield Corrals may have died from colitis, or inflammation of the colon. BLM is waiting for results from additional blood and tissue samples that could point to the cause, according to a press release. The foals were awaiting adoption at the corrals east of Susanville, Calif., when wranglers some of the foals had fallen ill. They were treated for their symptoms, according to BLM, but their condition worsened during the week of Oct. 2. None of the other 300 wild horses at the corrals have shown signs of illness. The foals were all born at the corrals to mares captured in 2016 from Devil’s Garden Wild Horse Territory at Modoc National Forest.